The battle between the Android platform and the Apple iPhone looks to be really heating up this year with the release of more powerful smartphones such as the Samsung Galaxy S3, but the iPhone 5 is being tipped to blow the competition away as a new patent hints at a redesign. It is being reported by AppleInsider that Foxconn CEO Terry Gou has told consumers to forget about getting the Samsung Galaxy S3 and wait for the upcoming iPhone 5 instead. The bold statement from the CEO came at the company’s annual stockholder meeting, and while the iPhone 5 was only briefly mentioned it may get some consumers thinking about waiting for the device. Gou stated that “the new model will put Samsung’s Galaxy III to shame”, and comes as Foxconn is looking to overtake Samsung in all of the markets that it competes in, and this is not the first time the iPhone 5 has been tipped to beat the Galaxy S3. 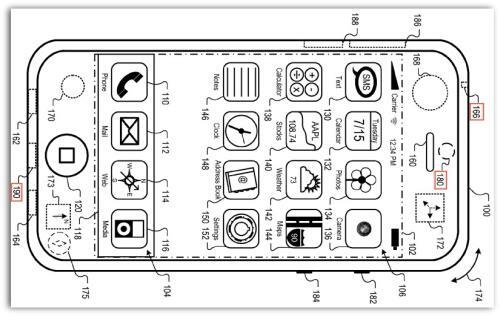 Meanwhile an article over at WebProNews is reporting that Apple has recently been granted a series of new patents that include a number of drawings, with one that can be seen below, which match up with recent rumours about the upcoming iPhone 5. The document doesn’t match up with the iPhone 4S so further strengthens the belief of a redesign for the new model. The patent can be seen here and shows the same basic iPhone design with some labels for the basic features of the handset, but some of these labels highlighted in red show some differences. One that is labelled 180 according to the patent explanations lists it as a camera lens and sensor, but it’s not in the same place as the iPhone 4/4S as it is positioned above the ear speaker, which is where recent leaked images of iPhone components put it. Another component labelled 190 on the bottom of the drawing is referred as the docking port, and is a lot narrower than the port found on previous models of the iPhone. This falls in line with previous rumours that Apple was working on a smaller 19 pin connector, but there are some differences from recent rumours as the component labelled 166 is for an audio jack, which is in the same place as before and not at the bottom as speculation has recently suggested. From the drawing it’s hard to tell much about the screen size but it seems it is proportionally larger than the 3.5-inch display currently used, and previously it has been suggested the iPhone 5 will come with a screen size of 4-inches across achieved by a taller display. This new patent application was originally filled in 2008 so along with all the leaked images it could be for a prototype handset that will never see the light of day. Although all the recent leaks and patents all seem to be pulling in the same direction, so there is a chance some of the clues will appear on the next Apple iPhone. Are you going to get the Samsung Galaxy S3 or wait to see what the iPhone 5 is like? Definitely the Iphone 5. I have had both Iphones and the SII in the past and the Samsung is utter trash. Apple win hands down. I have a Galaxy note. Amazing piece of hardware, but rubbish laggy, it doesn’t really work software. I really miss IOS. iphone 5 for me. Every Android I have had ends up being laggy and sluggish.Â No matter how high-end the android, the OS was NEVER as smooth as iOS. I have been with Apple for years now, and love them! Just think of how much will it cost? Iphone would do so much better if they dropped there prices! how is that? they do better then everyone else with high prices…what you said makes no sense. Â What he is saying is if Apple dropped prices, they would INCREASE already high sales. Did that make sense? No, because we pay for quality. quality? sold my iphone 4 after having the 1st, the 3gs. got sick of relying on iTunes etc, so got a s2. i see no quality difference and i can do anything i want with phone for free without wasting money on apps (like i did with apple). Holding an iPhone and holding a Samsung is night and day when it come to the physical qualities of the device.Â iPhone wins hands down.Â that can’t even be argued. I have both an iPhone 4 (iOS 5.1.1) & a Samsung Galaxy Nexus Prime (Android 4.0.4 Ice Cream Sandwich), both on contract, & out of the two I prefer the little qualities that make a nicer, smoother & more aesthetic (Visually pleasing) experience of my iPhone 4, however, it does have little drawbacks, when compared to my Nexus, such as being able to ‘Share’ a picture on Facebook on my Nexus, whereas, on my iPhone 4 I have to save the picture & upload it via a click of the ‘Photo’ button; conversely, this is not so easy on my Nexus, as with my iPhone 4 its just a click of the arrow in the top right corner & save photo from the pop-up dialogue, but I don’t seem to be able to save photo’s using my Nexus quite so easily. Therefore, in summing up, while both phones look aesthetically very pleasing (like a solid black sheet of glass, while off – with only the iPhone having the ever present home button, & the Nexus with the very nice touch of the multi-coloured (different colour depending on hat the notification is regarding, ie blue for Facebook, green for Facebook messenger, purple for email etc) eminating from under the smooth sheet of otherwise pure black glass (well, OK then, plastic), pulsing ominously slowly. Yes, they are both good phones, but I still prefer my iPhone for some reason, & will be upgrading to the iPhone 5 when I’m due an upgrade, but I won’t be upgrading my Nexus to an S3, as I like the looks of the Nexus better, & the iPhone 5 is rumoured to be better than the S3 also. We will see.